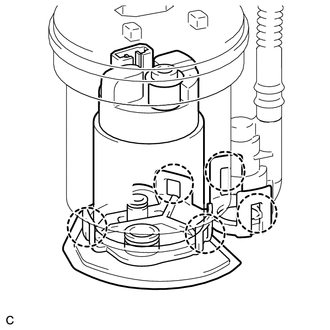 (a) Remove the fuel suction tube assembly with pump and gauge (See page ). 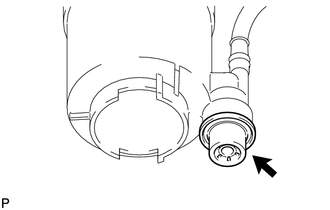 (a) Disconnect the fuel pump connector from the fuel suction plate. Do not damage the wire harness. (b) Using needle nose pliers, remove the E-ring. 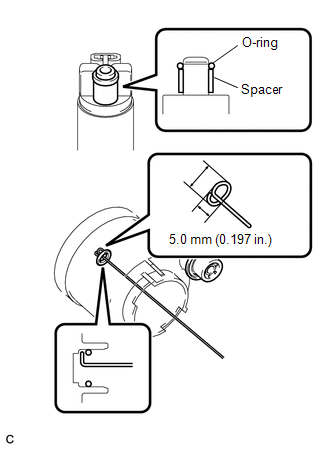 Do not disconnect the tube shown in the illustration when disassembling the fuel suction tube assembly with pump and gauge. Doing so will cause reassembly of the fuel suction tube assembly with pump and gauge to be impossible as the tube is welded to the plate. (c) Separate the fuel suction plate and remove the spring from the sub-tank. 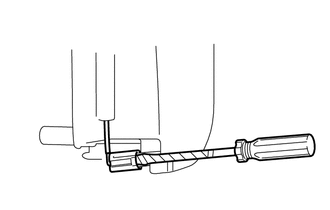 (d) Detach the 2 claws and remove the fuel filter from the sub-tank. (e) Using a screwdriver with the tip taped, detach the claw of the jet pump nozzle. (f) Using a screwdriver with the tip taped, remove the jet pump from the sub-tank. (g) Remove the O-ring from the jet pump. 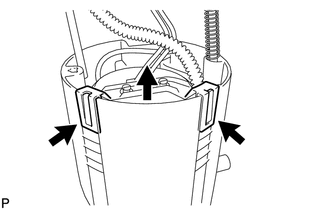 (a) Detach the 5 claws on the filter and remove the fuel pump from the fuel filter. Do not damage the fuel suction filter or fuel filter. 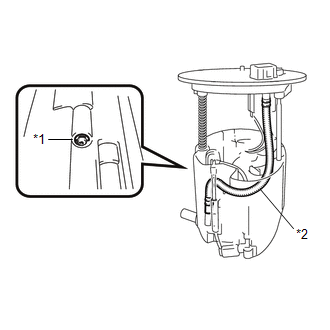 Do not remove the fuel suction filter from the fuel pump. Do not do anything which may separate the fuel tube from either the fuel suction plate or fuel filter assembly, such as applying excessive force to the tube (See page ). If the fuel filter assembly is to be replaced, replace the fuel suction plate sub-assembly. 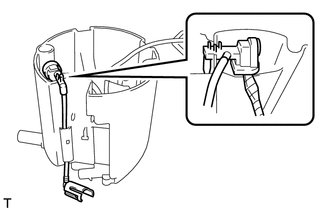 (b) Disconnect the fuel pump connector from the fuel pump and then remove the fuel pump harness. 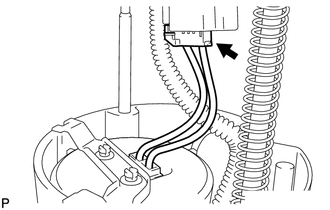 (c) Remove the O-ring and spacer from the fuel pump. Be careful not to damage the sealing surface. 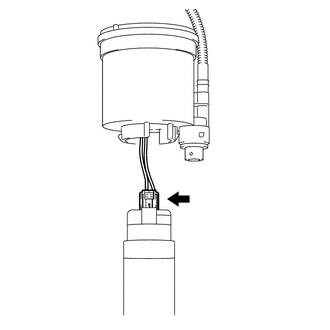 If the O-ring still remains in the fuel filter, remove it using a wire tip (φ1 mm) that is formed as shown in the illustration. 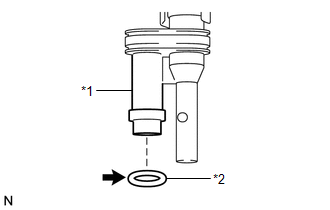 (a) Remove the fuel pressure regulator from the fuel filter. (b) Remove the 2 O-rings.